Bill Nye was the second celebrity eliminated in season 17 of ABC's "Dancing With the Stars," but he and professional dancing partner Tyne Stecklein remained upbeat while discussing their short-lived 'DWTS' experience on "Good Morning America" today. "It was the coolest thing. It was great," Nye told the "GMA" anchors in Times Square. After suffering a serious leg injury during his performance last week, Nye has been walking with a cane and unsure if he'd even be able to perform in Monday night's show. But Stecklein got creative with her choreography, going with a robotic-themed dance to Daft Punk's electronic pop hit, "Get Lucky." "We needed to do something that allowed for locked leg because, obviously, the one leg had to be, so I tried to pull some fun moves that were energetic," Stecklein said of her decision to go with the jazzy routine that allowed for Nye to wear a leg immobilizer and stick with mostly hand movements. And although Nye was dismissed, he made sure to give credit this morning to his partner whom he called "extraordinary," as well as everyone behind the scenes who helps put "DWTS" on air. 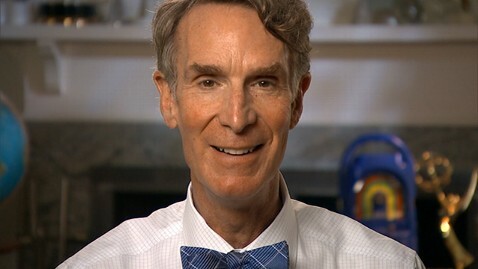 "The people who make that show are just experts," Nye said. "Let me tell you guys, the professionals really are that. She's [Stecklein] extraordinary. She's a world-class athlete, choreographer, coach and she's a cheerleader." Nye had gained a large fan base during his time on the dance floor. When his name was announced for elimination, there were several loud boos from the audience, to which he responded, "Thanks for keeping me in this long." Based on last week's performances, Nye and singer Christina Milian were both in the bottom two, putting them in jeopardy of being eliminated. Elimination is based on combined judges' and viewer votes. The audience votes from last week and Monday night were combined with the judges' scores from Monday's performance, and the star with the lowest total was sent home. Before the eliminations were announced, the entire cast had to dance new routines, for which one couple will be eliminated next week. The performances Monday night paid tribute to some of the biggest stars in Hollywood. Leah Remini: The actress' rumba had judges commending her continued improvement on the dance floor. Head judge Len Goodman said he loved the chemistry between Remini and her partner, Tony Dovolani, and said they were "terrific," but he said the actress at times lacked fluidity in her arms. Judge Bruno Tonioli said he liked to see people going outside of their comfort zones, but agreed that her arms needed more continuity of movement. Judge Carrie Ann Inaba said she liked the way Remini moved her arms, and said the actress had "turned up the steam notch to, like, full steam ahead." They awarded Remini 24 out of 30 points. Corbin Bleu: The actor's dizzying quickstep impressed Tonioli, who called it "one for the record books." He added: "Maintaining synchronicity at that speed is almost impossible and you did it … stylistically, it was so impressive," he said. While Inaba was also impressed, she said he lost some of his form as the routine progressed, and Goodman was the least impressed. "Well, for me, it was a bit hectic at times and speed came in and then style went out a little," he said, his comments being met by a chorus of boos. He went on to say he thought it was a "fabulous number." They awarded Bleu 26 points. Elizabeth Berkley Lauren: The actress' elegant foxtrot earned her raves from the judges. "Watching you dance is such a thrill. You've taken your performance to new heights this week," Inaba said, although she pointed out that the actress appeared to have gotten ahead of the music at one point in the routine. Goodman called the routine "chicken soup to the eyes" for being delicious and satisfying, while Tonioli called Lauren "a brilliant dancer." They awarded her 25 points. Brant Daugherty: After a rough week - he sprained a ligament, which limited his agility in practice, and then was robbed at gunpoint - Daugherty rebounded with a peppy quickstep that won him high praise. Goodman acknowledged that it may have been painful for Daugherty to perform with the injury, but he said it was "painless to watch." Tonioli called Daugherty the "perfect matinee idol" who played the part so well, with elegance, style and a joyful spirit. Inaba said Daugherty was a "fantastic dancer" with great musicality and lines. Daugherty earned 27 points. Valerie Harper: The actress stumbled through much of her cha-cha, and judges noticed, even as they praised her perseverance and her partner's commitment. "You went wrong so many times and you know, but it's hard … you just did a lot of mistakes tonight but you look great," Tonioli said. Inaba added that Harper lost her way "throughout the whole dance," but added: "What I love the most, and what's so spectacular about you is, when you shine you're like 'I don't know what I'm doing but I'm not going to give up' … I love that!" Goodman compared the routine to the bumps and discomfort of "flying coach on a cheap airline," but he praised Harper's partner, Tristan MacManus, for taking good care of Harper. Judges gave Harper 16 points. Bill Engvall: The comedian's bold, intense paso doble - a tribute to the Lone Ranger - earned him a rousing standing ovation, as well as enthusiastic approval from the judges. "Bill Engvall, you nailed the paso!" Inaba said. Goodman said the comedian came out "all guns blazing," and called the performance his best dance. Tonioli commended Engvall's attack. Engvall earned 24 points. Amber Riley: The actress' stylish, high-energy Charleston brought the audience to its feet, but judges found flaws. Tonioli commended Riley for her ability to create "rip-roaring excitement in the room" but he said her footwork needed to be sharper. Inaba agreed, saying that while the actress' upper body was good, the movements of her bottom half needed improvement during the routine. Riley earned 24 points. Jack Osbourne: Judges praised the TV personality's drive but they told him he needed to pay greater attention to the movement of his hips. "It was good but … not your best at all," Inaba said. Tonioli said the routine was ambitious and Osbourne kept the time throughout the performance, and Goodman praised Osbourne's commitment. Osbourne earned 22 points. Christina Milian: The singer's comedic Charleston found favor both with judges and with the audience. Inaba told the singer: "You just have this incredible, dynamic range of emotion when you dance. You really bring the characters to life." Goodman said the routine was "top notch," but he said he would have liked to see more Charleston content, and Tonioli said "all the stylistic details of the period were fantastic," adding that Milian performed better than she ever had. She earned 26 points. Nicole "Snooki" Polizzi: The reality TV star got her wish for a higher score with a quickstep that Inaba described as an "incredible performance." Tonioli said he admired Polizzi's commitment to hard work and that hard work showed in her performance, and Goodman said he was surprised by Polizzi's performance in her first ever ballroom style dance. Her previous routines had been Latin dances, he said. Polizzi earned 25 points. Bill Nye: Because of a significant leg injury during his performance last week, there was some doubt as to whether the scientist-slash-TV host would perform last night, but he went against his doctor's advice and danced anyway. Nye came out onto the dance floor in a leg immobilizer, complementing it with a sparkly helmet and chest plate to dance a jazzy routine to Daft Punk's electronic pop hit, "Get Lucky." His futuristic routine consisted of lots of robotic hand movements, with minimal movement of his legs. "Bill, to perform with that type of injury, it takes guts, it takes determination and bravery … that shows a lot about the man. Well done," Goodman said. While all three judges commended his courage, they had to score him based on his performance. They awarded him 16 points.